Mathematics is more than gaining some numerical and reasoning skills so we can keep count of our paycheques, it has become the language of technology that can open doors into so many careers from engineering and business to software development and games design. Whether you are drawn to the big-sky thinking of pure maths that provides a means of codifying the complex into something more reasonable, or you are drawn to the practical maths with statistics that will teach you the tools for using and displaying data for report writing in business, scientific research or efficiency measurements for a new engineering design. 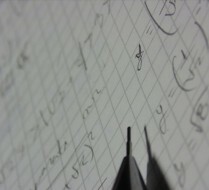 Maths is essential to our future and could be the key to unlocking a rewarding career.